It was a grim session for local shares after fears about China's economy belted the market and ruined the week for investors. 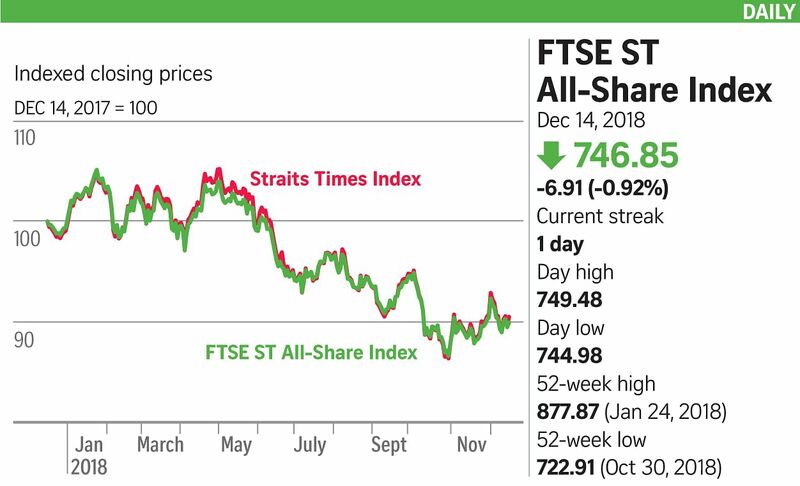 The Straits Times Index (STI) tumbled 1.09 per cent or 33.99 points to 3,077.09, erasing the entire week's gains in one dismal day. Only four of the 30 constituent stocks ended the day in the black. About 1.1 billion shares worth $859.5 million changed hands, with losers thumping gainers 240 to 148. Investors had been on a high earlier in the week on the back of optimism about a trade breakthrough, but the buoyant mood evaporated with new signs of an economic slowdown in China. China's November retail sales and industrial output figures dominated headlines yesterday for all the wrong reasons, highlighting the continued pressures on the economy. Retail sales grew 8.1 per cent from a year ago, well below the forecast 8.8 per cent rise and the slowest since May 2003. Industrial output also missed estimates of 5.9 per cent growth, rising 5.4 per cent instead. That erased gains across the region yesterday, leaving key indices to end mostly down on the week. But remisier Charles Chua said the "jittery" mood was more likely linked to the European Central Bank (ECB) ending its bond-buying policy on Thursday. While the ECB announced plans to wind down the programme in June, the move comes amid a slowing European Union economy. It may soon have to use other means to stimulate growth if the bloc's recovery continues to slow, economists told the BBC. Regional markets were hit alongside the STI. South Korea's Kospi gave up 1.25 per cent, S&P/ASX 200 in Sydney shed 1.4 per cent, as did Japan's Nikkei 225. The Hang Seng in Hong Kong eked out a 0.1 per cent gain for the week, while Shanghai shares lost 1.5 per cent to end the week 0.5 per cent in the red. Construction firm MMP Resources was the most active here, ending flat at 0.7 cent on a volume of 61.8 million shares. Singapore Airlines (SIA) said yesterday regional arm SilkAir will operate daily flights to Cairns from June 2, up from the five flights a week now. SIA shares closed 2 per cent down at $9.33 after the news. Furniture seller Lorenzo International suspended trading yesterday after its auditor raised doubts about its status as a going concern. The firm had projected profitability for the next year based on sales and related forecasts, and its ability to refinance borrowing. But auditor Foo Kon Tan said the cash flow projection for the next 12 months resulted in a net cash outflow and the group may not be able to discharge its liabilities.